Ready, Set, GO! 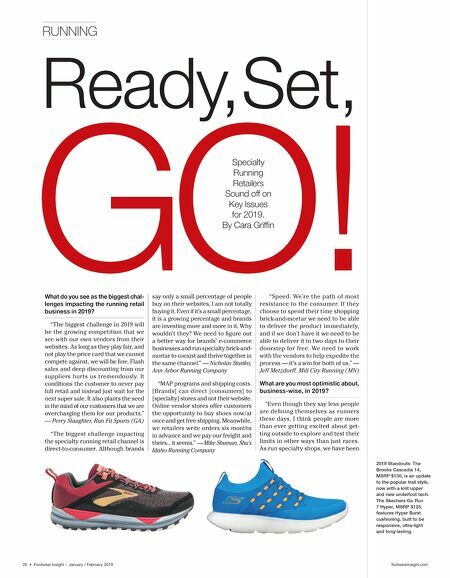 Specialty Running Retailers Sound off on Key Issues for 2019. 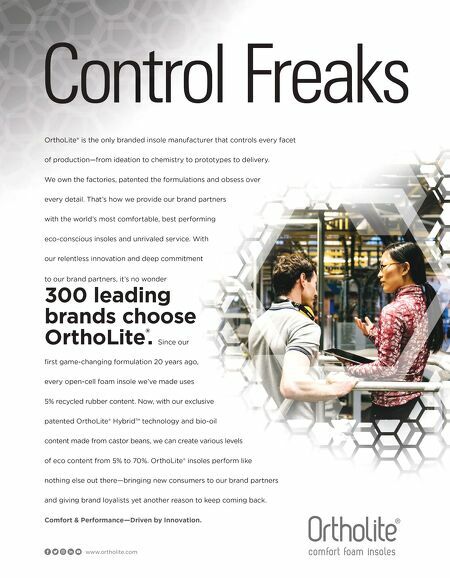 By Cara Griffin RUNNING 26 • Footwear Insight ~ January / February 2019 footwearinsight.com What do you see as the biggest chal- lenges impacting the running retail business in 2019? "The biggest challenge in 2019 will be the growing competition that we see with our own vendors from their websites. As long as they play fair, and not play the price card that we cannot compete against, we will be fine. Flash sales and deep discounting from our suppliers hurts us tremendously. It conditions the customer to never pay full retail and instead just wait for the next super sale. It also plants the seed in the mind of our customers that we are overcharging them for our products." — Perry Slaughter, Run Fit Sports (GA) "The biggest challenge impacting the specialty running retail channel is direct-to-consumer. Although brands say only a small percentage of people buy on their websites, I am not totally buying it. Even if it's a small percentage, it is a growing percentage and brands are investing more and more in it. Why wouldn't they? We need to figure out a better way for brands' e-commerce businesses and run specialty brick-and- mortar to coexist and thrive together in the same channel." — Nicholas Stanko, Ann Arbor Running Company "MAP programs and shipping costs. [Brands] can direct [consumers] to [specialty] stores and not their website. Online vendor stores offer customers the opportunity to buy shoes now/at once and get free shipping. Meanwhile, we retailers write orders six months in advance and we pay our freight and theirs... it seems." — Mike Shuman, Shu's Idaho Running Company "Speed. We're the path of most resistance to the consumer. If they choose to spend their time shopping brick-and-mortar we need to be able to deliver the product immediately, and if we don't have it we need to be able to deliver it in two days to their doorstep for free. We need to work with the vendors to help expedite the process — it's a win for both of us." — Jeff Metzdorff, Mill City Running (MN) What are you most optimistic about, business-wise, in 2019? "Even though they say less people are defining themselves as runners these days, I think people are more than ever getting excited about get- ting outside to explore and test their limits in other ways than just races. As run specialty shops, we have been 2019 Standouts: The Brooks Cascadia 14, MSRP $130, is an update to the popular trail style, now with a knit upper and new underfoot tech. The Skechers Go Run 7 Hyper, MSRP $125, features Hyper Burst cushioning, built to be responsive, ultra-light and long-lasting.